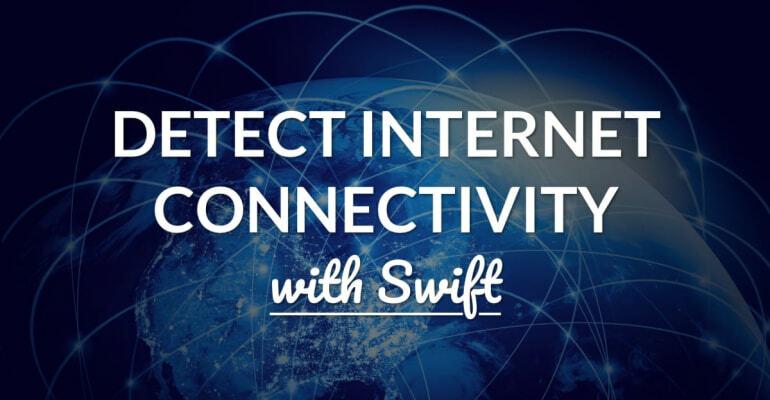 Detecting an iOS app’s internet connectivity is useful, especially if you want to check if the internet is reachable prior to making a network request. Before iOS 12, a code snippet called Reachability was the de facto approach to determining if the internet could be accessed. iOS 12 introduces a new component, called NWPathMonitor, that makes detecting internet reachability easier and more insightful. If your app supports iOS versions before iOS 12, you’ll want to use the older Reachability component. It uses the SCNetworkReachability class to create a network socket, and to listen for changes. Fortunately, that’s all abstracted away. The closure we defined earlier is now called whenever the network connectivity status changes. We could have used two different closures, but it’s simpler to use just one. After all, the connection property only has 3 states: .none, .cellular and .wifi. It’s also smart to create a reachability property in your code, so the object is retained throughout the lifetime of your app. It’s also an effective use case for a singleton, in fact. In the above code we use error handling to check if the notifier could be started. When it can’t, we can respond by default with a state that has no internet connection. When using Reachability, don’t use a hard-coded IP address to check if a particular webserver is reachable. Use a domain name instead, otherwise your app becomes incompatible with either IPv4 or IPv6 networks. At WWDC 2018, Apple introduced the NWPathMonitor component as part of the Network framework for iOS 12. This means we won’t have to rely on 3rd-party code anymore to monitor network changes. The way NWPathMonitor works is similar to Reachability, but it gives a lot more information about the network we’re connected to. In short, we’ll need to create the NWPathMonitor, register an update handler, and start the update notifier. Again, you’ll want to create a strong reference to this NWPathMonitor object somewhere, so it’s retained in memory. Adding it as a property to your AppDelegate class is one approach to do that. You can use the function usesInterfaceType(_:) to check which interface type this network path uses. This is the most effective way to figure out if your app is connected over WiFi, cellular or ethernet. When the status property has value .satisfied, you can be certain there’s internet connectivity via that network path. When it’s .unsatisfied, the network path isn’t available and there is no internet access. The third case of status is .requiresConnection. It’s unclear what it does exactly, for a lack of documentation, but it appears that this state indicates that the path could become available in near future, i.e. when a VPN connection or captive portal finishes setting up an internet connection. The monitor will now start receiving network path updates. So, whenever the network changes, the closure will get called and you can respond to changes in internet connectivity. An interesting scenario occurs when you set requiredInterfaceType to .cellular, sign on to a WiFi network, and then wait for network updates. The path will show as “unsatisfied (Interface type cellular is required by parameters)” and path.usesInterfaceType(.wifi) will return true. This kind of fine-grained control and information is perfect for mediating the best-available network path, such as downgrading to cellular when WiFi won’t work. You might wonder why you’d want to monitor for internet connectivity when you can just make an HTTP request and check if it succeeds. Let’s discuss the use cases for practical connectivity detection. If you know that your app is connected to the internet before making a request, you can more efficiently make that request. When there’s no connectivity, you don’t even have to attempt to make that request. Some apps also rely on an active internet connection. Take database platforms like Firebase and Parse Server, for example. They support a so-called offline mode, in which data that’s written to the database is temporarily cached locally when there’s no active internet connection. An app’s users don’t notice anything from this behavior, because they can use the app regardless of having internet connectivity or not. When the network comes back online, changes they made in the app are sent to the server as if there was no lapse in connectivity at all. This functionality is crucial in making offline-first apps. The NWPathMonitor component gives you more insight in the state of network connectivity, and allows you to make sensible choices about network requests prior to making them. The component is more advanced than Reachability, although the simplest approach is still as easy as registering a callback and starting to monitor network changes. Neat!